Lord Bingo News Bingo Promotions bet365’s Top of the Shops! bet365’s Top of the Shops! It's January and the sales have begun! We know you're all on the hunt for some special bargains and shopping gems! Luckily, you don't have to go searching through the endless sales racks just to find the rare bargain from last season! 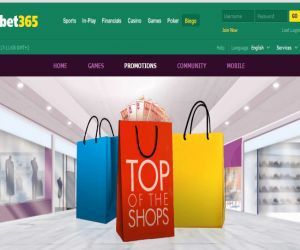 You can simply head to bet365bingo to win a stylish share of up to £1,600 in Love2shop Vouchers! If that's not enough, you can head to the Bargain Bingo room to snap up extra bargain-boosting chances to win throughout January! January is all about the sales! If you like shopping around for a bargain as much as us, then the month is usually spent on never-ending shopping trips, in search of the best outfits, the best gadgets and the best deals for the best price! With bet356bingo, you don't have to, as from 2nd to 29th January, you can snap up the chance to win a glamourous share of up to £1,600 in Love2shop Vouchers. Each week, you can scoop vouchers worth £50, £100 or £250 or a slice of the £250 Community Jackpot! Just make sure you hit the exclusive Gifts Galore room at selected times and buy tickets for as little as £1, and you can earn tickets to the All-Winners Finale game in the same room each Friday at 9pm! With your new-found vouchers, just think of how many more extra bargains you can buy! You can even take some guilt-free trips to the shops to buy items at full price! After all the festivities of last season, we know your wallet has probably suffered some damage! So thankfully, bet365 Bingo is offering plenty of bargain-busting chances to win throughout January! All you have to do is hit the exclusive Bargain Bingo room at selected times between 1st and 31st January, and you can snap up the chance to play 600 extra exciting games! The extra games can be played between 12pm and 11:55pm Monday to Friday and 5pm to 11.25pm each Saturday and Sunday, at low prices! bet365bingo has even thrown in some juicy Free bingo games at selected times, to give you even more chances to scoop extra prizes! You can check the bet365bingo site for the full schedule, so just make sure you're in it to win it!